3dcart is an award-winning shopping cart software designed to cater to businesses of all sizes. It won our Great User Experience Award for 2017. With 3dcart’s powerful ecommerce platform, users can easily build their online stores and achieve success thanks to its wide set of features as well as partnerships with over 200 leading business service providers, ranging from shipping carriers, tax calculators, payment solutions, and more. With 3dcart, users are given access to ecommerce tools dedicated for store building and management. Other features include order management and marketing tools. A detailed review of 3dcart is also available where you can find more information on its features, pricing and user experience. Provide sellers with an effective and powerful platform to market and sell their products online and give customers a seamless and easy way to order online. Have complete control over your eCommerce software via 3dcart’s secure administration interface. Access the system, customer data, shop inventory, and invoices securely from any computer connected to the internet. Choose from a wide range of free professionally designed templates or have a custom premium theme made to fit your store, brand, and image. A team of ecommerce professionals are always standing by to assist you with any issues that arise from your ecommerce sites. 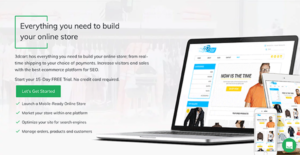 3dcart, an all-in-one eCommerce solution, provides merchants worldwide with an easy, feature-rich platform for building and managing their online store. Every 3dcart account has access to built-in social media integration, order management software, email marketing tools, a blog, email, an iPad compatible Point-of-Sale app, and dozens of additional, robust features designed to provide large and small retailers alike with the tools they need to grow and expand their business. 3dcart offers reliable technical support with expert representatives available 24/7/365. Furthermore, its developers work vigorously to provide new, innovative services and features on a regular basis, ensuring 3dcart remains an eCommerce trendsetter. With the launch of its new platform, 7.0, 3dcart has become a powerful and scalable eCommerce platform, the ideal solution for any online retailer, regardless of their stage in the life cycle of a business. What Problems Will 3dcart Solve? Problem 1: New Mobile-Friendly Standards – With colossal changes to popular search engines’ mobile-friendly standards, online retailers globally have struggled to upgrade their stores from non-responsive to responsive; an industry-expected change supported by search engines and consumers alike. To assist online store owners with this massive change, 3dcart offers 100+ responsive, mobile-friendly themes, all of which can be installed and applied within a few minutes. At no additional cost, a 3dcart customer can update their store to meet mobile-friendly standards, thus removing any threat of search-engine penalization. Problem 2: Experience with Web-based Languages – Building and managing an online store takes dedication, time and invested revenue. However, many online retailers do not anticipate a necessity for familiarity with web-based languages. With 3dcart, online retailers require absolutely no experience with any type of web-based language. The platform is designed for user-friendliness and ease-of-navigation, with the ability to customize design and content without ever needing to modify coding. For 3dcart customers versed in web-based languages, design customization is possible. Whether customers are looking to use their own template, make modifications to a 3dcart theme or insert various scripts of their own making, 3dcart provides the freedom for customers to design their website without restrictions. Problem 3: Payment Providers – Many only retailers launch their business with every intention of growing and expanding globally, only to find themselves limited in unexpected ways. Although a website may be accessed from any location, unless a retailer has a means of collecting payment, growth is severely limited. For online retailers, having access to a varied selection of Online Payment Gateways is an absolute essential given that most gateways are limited to accepting payment from specific countries and regions. If a merchant does not have access to a wide variety of gateways, they may find themselves unable to expand their market beyond domestic borders. 3dcart customers have access to over 100 ready-to-use payment solutions, more than any other eCommerce platform, ensuring their ability to grow and expand domestically and internationally. If you are considering 3dcart it could also be sensible to analyze other subcategories of Best eCommerce Software collected in our database of B2B software reviews. Each business is different, and may need a particular type of eCommerce Software solution that will be fit for their business size, type of customers and staff and even individual industry they deal with. You should not count on finding an ideal software that is going to work for each company no matter what their history is. It may be a good idea to read a few 3dcart reviews first and even then you should pay attention to what the service is intended to do for your company and your staff. Do you require a simple and intuitive app with just basic features? Will you really use the complex functionalities needed by pros and big enterprises? Are there any particular features that are especially beneficial for the industry you work in? If you ask yourself these questions it is going to be much easier to get a solid software that will match your budget. How Much Does 3dcart Cost? We realize that when you make a decision to buy Shopping Cart Software it’s important not only to see how experts evaluate it in their reviews, but also to find out if the real people and companies that buy it are actually satisfied with the product. That’s why we’ve created our behavior-based Customer Satisfaction Algorithm™ that gathers customer reviews, comments and 3dcart reviews across a wide range of social media sites. The data is then presented in an easy to digest form showing how many people had positive and negative experience with 3dcart. With that information at hand you should be equipped to make an informed buying decision that you won’t regret. A robust platform for ecommerce. An ecommerce tool that offers versatility and flexibility. This tool is a must if you plan on opening up an online store quickly. Navigating is easy even more so with usage. What are 3dcart pricing details? What integrations are available for 3dcart? Pros: It has an excellent UI. It lets users add in products, effectively organize product pages, manipulate images, and organize other aspects to your site. It comes with full integration and offers plenty of ecommerce tools for payment, shipping, and others. 3dcard is packed with little learning curve, and a helpful support community. Cons: Our site is making use of personalization options. We realized it's a bit challenging to get the options menus to function. We couldn't get it work the way we want it to. This is one particular area that needs to be looked into. If they can find a way around this, then this ecommerce software will do wonders. Pros: 3dcart is simple to utilize. I find it very intuitive. From its backend, the dashboard shares similarities to its competitors that I've used for ecommerce site building. The standout with this is that it's super easy to use. If you happen to be a veteran of HTMLs, then you can pretty much customize everything with it. Cons: I was hoping it would come with more plugins such as WooCommerce or WordPress. It'd be nice if a Yoast SEO Premium Plugin could work hand in hand with 3dcart or it would've been a whole lot better if 3dcart came up with a module similar to that. One of the most simplest and highly configurable ecommerce site builders that I've ever come across. A worthy e-commerce building tool. Great for the online market. If you need more information about 3dcart or you simply have a question let us know what you need and we’ll forward your request directly to the vendor.